The first motorcoach accident investigated by the NTSB occurred in 1968, when a charter coach overturned and burned near Baker, California. Nineteen of the 30 passengers aboard were killed. Even way back then, the NTSB found that “one of the primary causes of passenger injury and fatalities in motorcoach accidents is that the passengers are thrown out of their seats or ejected when a bus sustains a front, side, or rear impact or rolls over,” and they advocated passenger restraint systems. On February 14, 2003, a crash near Hewitt, Texas, killed 5 and injured 9, and the NTSB found that the fatalities were a result of occupants’ being ejected from their seats. In passing the final rule requiring safety belts in motorcoaches after 2016, NHTSA took what some consider to be just the first step toward passenger safety. They did not require that older buses be retrofit with seatbelts, nor did they take measures to help ensure that passengers avail themselves of the safety equipment when it is available. In light of the fact that innocent people are still dying in motorcoach accidents, even when safety belts have been installed, it would seem that an additional step could provide additional protection – i.e., reminder systems like what we are accustomed to in our personal vehicles and on airplanes. Wow. 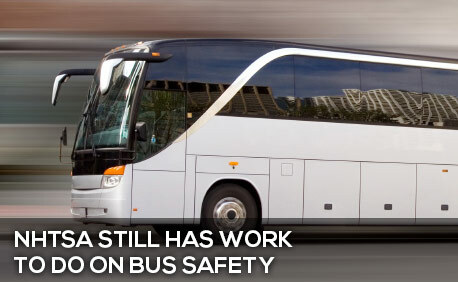 No wonder it took an act of Congress (the Motorcoach Enhanced Safety Act of 2012) to put safer buses on the road, resulting in the NHTSA rule re seat belts. Sounds like NHTSA needs to improve upon its own rule and also find a way to make passengers take advantage of the improvements the carriers have to pay for. And they haven’t even addressed the other topics Congress told them to look at, like ease of evacuation, fire suppression, smoke suppression and improved fire extinguishers, all factors which could have been at play in the California crash.